Posted June 9, 2015 by davezumbekphoto & filed under Lifestyle, New Products, Portraits, Products & Services, Promotions. $75 – Half hour shoot with 5 edited digital photos. 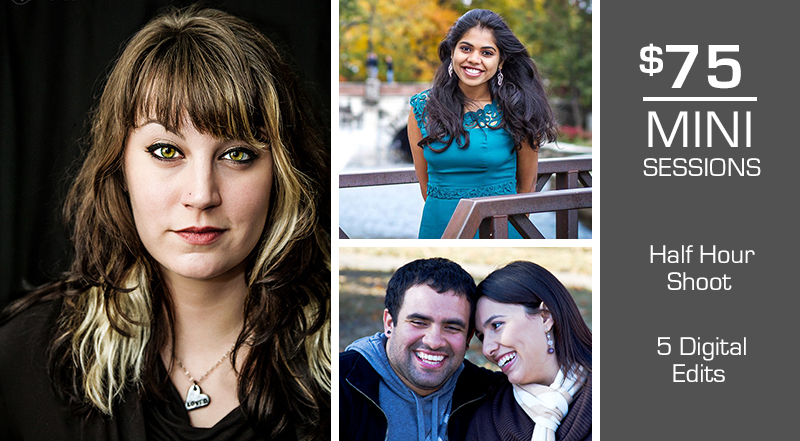 $100 – 45 minute shoot with 8 edited digital photos. $150 – 1 hour shoot with 12 edited digital photos. $250 – 2 hour shoot with 25 edited digital photos. What Types of Shoots are Considered Portraits? Portraits are posed or candid shots taken in either an indoor studio or outdoor setting. Themes for portrait sessions include engagements, senior photos, families, babies, head shots, couples, pets, glamour, pin up, and more. On location portrait shoots are often outside when the weather is nicer, but they can be indoors depending on the location and circumstances. Dave Zumbek Photography specializes in portrait photography around the Peoria, IL, with occasional shoots in Chicago and St. Louis. To see past portrait examples, click here. Portrait sessions are by appointment only. For more information or to schedule a shoot, use the form below.